terrorism.The film is being presented by Narayan Films, and is being produced by Mr. Shantanu Singh and directed by Mr. Suvahhdan Angre. Speaking on the occasion, Mr. Shantanu Singh, Producer of Billu Ustaadsaid, “I believe in concept-based cinema. The film is socially relevant and is based on the life and hardships of children in orphanages. Suvahhdan is a brilliant director and it has been great working with him. We make a good team." “Shantanu and I share the same vision about the kind of stories we want to tell through our films.And,I am glad that I got this opportunity to make a film that is so close to my heart. I’m sure this film will remain with the audiences for a long time and hopefully, help bring about a change in the society and life of children in orphanages,” saidMr. Suvahhdan Angre, Director of Billu Ustaad. The songs of Billu Ustaad have been rendered in the voice of Kailash Kher and Vaishali Samant.Music Director for Billu Ustaad is Shreerang Aras and lyrics have been penned by Sachin Nikam and Divyesh Mungra. 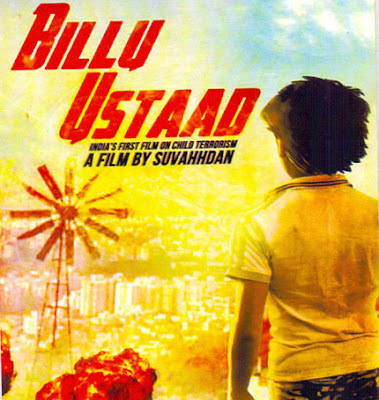 Billu Ustaad, is a story of a boy named Billu and his friends, and their lives in the Anathashram (orphanage). Billu is a courageous and confident boy, who is aware of the happenings around him. He has four good friends, whom he plays, laughs and fights with. The story takes a twist when Billu’s friends are kidnapped by terrorists and brain-washed to do terrorists activities. Billu along with an IAS officer Ajay and ATS officer Siraj gives a tough time to terrorists is highlighted in this movie. Suvahhdan is known as Producer/Director for his maiden film “Aadesh-Power of Law” made on the life of Public Prosecutor, Mr. Ujjwal Nikam, which is scheduled to release in the next two months. He is also directing another film on the dreaded underworld Don Abu Salem.Suvahhdan Angre has assisted in well-known films Like Tare Zameen Par, The Myth (Hollywood), Jodhaa Akbar, and Om Jai Jagdish etc. and has been in Bollywood for the past 15 years.